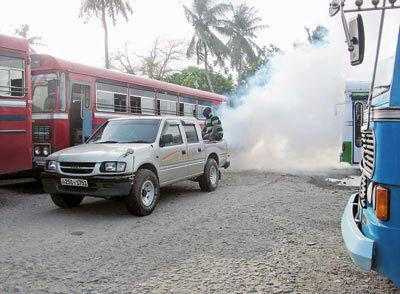 State institutions in the Western Province have turned out to be the main breeding grounds for dengue mosquitoes, claiming 44 lives and making 25, 365 ill during the past seven months. Railway yards and reservations, railway quarters, government housing complexes, old state buildings, prisons, ports and bare land belonging to state institutions have been identified as having the highest mosquito density, according to health authorities. Illegal construction in government flats in the Colombo district is a menace with most of the Colombo dengue cases being reported from these quarters. National dengue cases have gone up 30 per cent from 2014 Colombo Municipal Council (CMC) Chief Medical Officer of Health Dr. Ruwan Wijayamuni said. More than half the victims were children under five years of age. “I suspect the reason for more child victims is because children are active in the dawn and dusk and mosquitoes are also active at that time,” Dr. Wijayamuni said. “With the increase in the number of dengue case in the January we changed our strategy,” the medical chief said. “We stopped open-air fogging during the daytime and started sending teams out at 5am to fog places such as low-income settlements, condominiums as well as in open areas with the aim of knocking down the female Aedes mosquito.” The aedes mosquito, which can be recognised by white markings on its legs, is a notorious carrier of viruses such as dengue, zika, yellow fever and chikengunya. The new strategy has been successful, Dr. Wiyayamuni said, adding: “This is the reason that dengue did not reach epidemic proportions”. Dr. Wijeyamuni warned that ignoring the fever and trying self-medication – particular traps for young adults – should be avoided. “By self-medicating one is just trying to treat a symptom, that is, fever. Sometimes self-medication leads to overdosing with pain-relieving drugs and this can affect the body’s organs, such as the liver. Paracetamol could relieve symptoms of fever and joint pain but drugs such as ibuprofen and aspirin can cause complications,” he said. Rest was important for children. They should be kept at home and given fluids, not only water, but also Jeewani (oral rehydration solution), congee, fresh fruit juices and soup. Sponging with warm water was also recommended to relieve fever. “We are concentrating on high-density population areas such as such as Modera, Mattakuliya, Fort, Grandpass, Cinnamon Gardens, Wellawatte and Kirula where in one house eight to 10 people might be living,” Dr. Wiyayamuni said. Crowded flats occupied by low and middle-income families in high-rise buildings were also being targeted. CMC statistics show Colombo East has recorded the highest number of cases (432) comprising Narehenpita (120), Kirulapone (220), Kirula (46) and Pamankade (46). Colombo West had 240 cases, Colombo Central 292, Colombo North 222 and Borella 241 cases. Last year, of the Rs. 300 million allocated by the Health Ministry to control the deadly mosquito-borne disease only Rs. 97m was used, the official said. “The Health Ministry’s Epidemiology Unit did not have a proper plan or mechanism on how to use resources to prevent the disease. Cleaning campaigns, awareness programmes, inspections and much more could have been done in the Western Province and other areas,” a ministry source said. “Rs. 30 million was allocated from the council’s budget for chemical spraying, and an extra 50 labourers were deployed but there are about 100 vacancies for health inspectors,” Dr. Wijeyamuni pointed out. A specialist attached to Epidomology Unit, Dr. Hasitha Tissera, said there was no specific treatment for dengue fever and the only way of curbing the disease was to destroy or prevent the spread of dengue mosquito breeding sites. “There should be proactive surveillance: where even only a couple of people fall ill with dengue in an area the authorities should immediately visit the house and its neighbourhood to conduct cleaning programmes and fumigation. At present, preventive measures take place only when a death occurs – this is too late. The dengue mosquito is not a long distance carrier,” Dr Tissera said. Statistics collected by the Epidemiology Unit show that so far this year there were 8,023 dengue cases reported in Colombo, 1,398 in Jaffna, 2,189 in Gampaha, 1,737 in Kalutara, 300 in Trincomalee, 458 in Badulla, 485 in Hambantota and 449 in Kurunegala. At the age of 38, Lakshani Dias from Hampdon Lane, Wellawatte is widowed and childless following the deaths of her husband and son of dengue haemorrhagic fever five months ago. Her husband A.K. Dias, 40, and her nine-year-old son, Damitha, had been suffering from fever. “After one week of continuous fever I took both to the closest clinic and the doctor advised me to get a full blood count test if the fever continued,” she said. “The blood results were delayed and it showed a red seal on my son’s report, which meant an emergency. I took him to the hospital but the doctor told us that our son was in the last stages of dengue fever. “Just hours before he died, he was promising to come home all cured,” the grieving mother said. On her husband’s blood report there was no sign of a reduced blood count. He had been taking medicine for his fever but had ignored his own health concerns out of worry about his son. “My husband was partially cured but after one month he got a high fever and again we had a blood check. Following the blood test, Mr. Dias was admitted to the National Hospital in Colombo. Two days later he was moved into the Intensive Care Unit where he died. Dengue is taking a heavy toll irrespective of whether the victim is rich or poor, Ms. Dias emphasised.